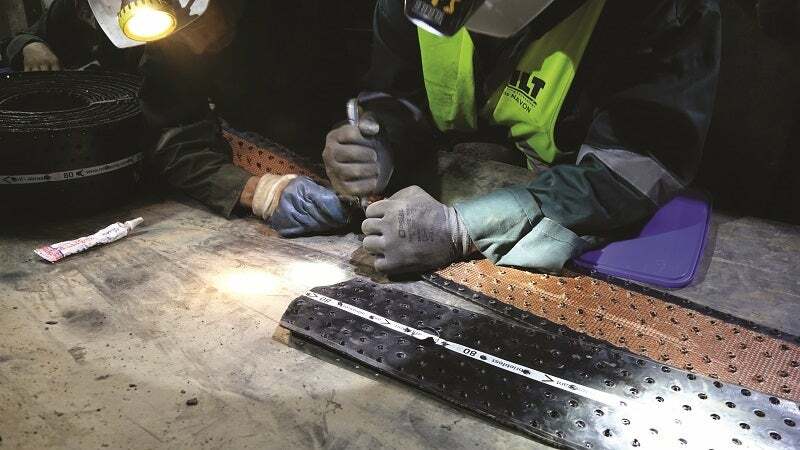 Minet Lacing Technology (MLT) manufactures a broad range of innovative conveyor belt fastener solutions for mining and aggregate operations. MLT offers a full range of products to suit any conveyor belt, from heavy-duty belts (Super-Screw, MS Fasteners) to light-duty belts (Self-Lock, Clip ‘n Lock, PVC/PU lacing). We launched a new product in 2016 for repairing belts (Fix’ N Go). Each of these products will be discussed in greater detail under the Products & Services tab above. MLT has been supplying operations of every size with the right solution since 1945. We offer 19 different product options for conveyor belt fasteners and splices, creating more than a million unique part numbers to meet your specific needs. From MLT’s Super Screw product line to its full line of mechanical fasteners, the company sets the benchmark for highly reliable solutions for your conveyor belt needs. MLT offers clients the ease of mind knowing you are securing the most efficient method to repair or install a conveyor belt. We are here to help you create the best solution, using a wide range of products such as our Super-Screw rubber splice, MS mechanical fasteners, and G2000, Titan and Record V6 connectors. The company’s portfolio focuses on the simplicity of repairs, ease of portability at the site and substantially extending the life of your conveyor belt. Super-Screw is a flexible, rubber splice to fix onto the conveyor belt, as an alternative to vulcanizing. The key difference is in the MLT-specific screws, which are self-drilling, self-tapping and made of the highest quality. MLT technology enables the Super-Screw to be installed at anytime and anywhere, regardless of the location, accessibility of conveyor belt or weather conditions, resulting in a significant reduction in downtime. The Super-Screw can be ordered pre-cut to your specified length or in a roll to cover multiple uses. It’s a three-in-one solution, combining splicing, repairing, and patching. In addition, the quantity of screws and spacers required for assembly are matched up to maximize quality in your specific installation. The only equipment needed is a cordless or electric drill, with a cutting tool. The conditions of use would determine the rubber composite material. The MS is a fastener that uses self-tapping screws for heavy-duty belts, but does not need drilling, a template or any hammering. They are the only mechanical fasteners that are installed using battery-operated, electric or pneumatic screwdrivers. The screws drill smoothly in the belt with a variety of measurement options, while maintaining belt integrity. MS fasteners are more economical since there is no investment in manufacturer-specific or complex tooling. Installation is very simple, as it does not require specialized equipment or training. In addition, MS fasteners offer a distinct advantage in that all types of belts can be repaired and the belt is also clamped by the fastener itself. The fastener can also be installed closer to the carcass after the rubber covers have been skived. The skiving tools feature our PS15 Standard Belt Skiver that can skive belts from 1/16″ to 5/8″ thick (1.59mm to 15.88mm). The Record V6 connectors have pre-assembled staples and solve a large range of applications. With its continuous length, the G200 and the Titan are solutions that customers count on from MLT. As the inventor of the world’s first belt fasteners with a hinge, Minet Lacing Technology in France, has been producing conveyor belt fasteners since 1945. The first subsidiary, MLT Inc, opened its doors in 1999. Widely known for its innovative and technical development, MLT is helping customers to increase the productivity and efficiency of today’s conveyor belt. We ship products to customers and distributors the same day for any order received by 2pm Eastern Standard Time (EST). For more information, please visit the Product and Services tab or check out our video. Minet Lacing Technology is excited to announce its newest innovative product line, the Fix' N Go. Minet Lacing Technology offers a wide range of mechanical splices for mining applications. The PS 15 Standard is a high-quality skiving tool with an off and four heat settings. For more information, please click on the image and download the data sheet at the bottom of the page. Covers everything you need to know about the Super Screw, including its construction, belt strength, composite materials available, sizing the screw length, getting the correct product number, and some additional uses. Tahuehueto is an advanced-stage poly-metallic project located in the Durango State of Mexico.